Here’s a strange thing, a seedy curio rather than a massive scandal, but I’d be interested to know what you make of it. This week lots of academics all received the same unsolicited marketing email from a large well known research company called Cyagen, who make transgenic mice, stem cells, and so on. The email was headed “Rewards for your publications”. In it, Cyagen make a rather strange offer: “We are giving away $100 or more in rewards for citing us in your publication!”. There are some big problems in medicine, and the public are right to be concerned about our shortcomings. 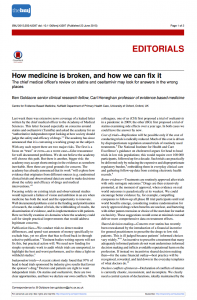 Last week we found out that the Chief Medical Officer has written to the Academy of Medical Sciences, asking for an authoritative review into problems in the evidence we use to choose treatments, focusing especially on concerns around statins and tamiflu. Will the Academy’s review be a whitewash? We hope not. But we are concerned that they may suffer from a lack of vision, and ambition, in trying to fix the problems in medicine. 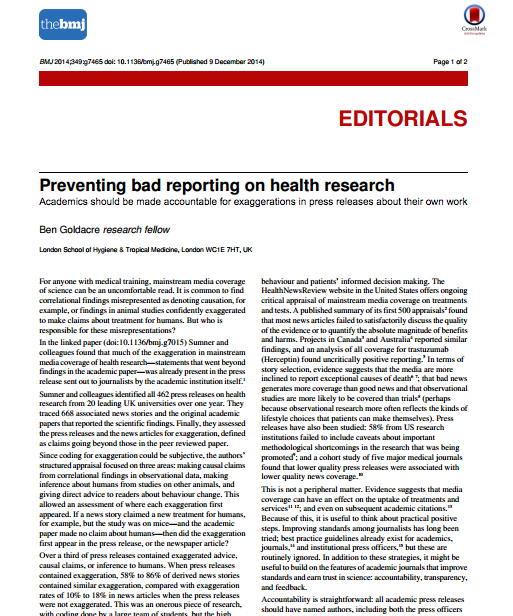 So here is our call to arms, in a BMJ editorial. Like everything, I hope it is accessible to a general audience as well as doctors and researchers, because we need everyone’s help to fix these problems. We demonstrably cannot move forward on our own, because we have not. And now, in whispering tones: this list of fixes is taken from a longer list in the last chapter of my super secret new book on statins, out in six months, which I am “not yet talking about” in public (you heard it here first). In that book I set out the evidence on statins, what we know, what we don’t know, and how we can get better data. Then, I set out a Better Medicine Manifesto: clear, deliverable fixes, that will make medicine better, to a soft metal soundtrack. That YouGov parlour game is wrong. This annoys me. YouGov have produced a fun, popular new parlour game. You give the site the name of a celebrity, author, TV show, pet, activity, or anything; and it gives you a lot more information in return. Essentially: “other things that such a person typically does and likes”. So, the “favourite dishes” of people who read Ben Goldacre books are Vegetarian Thali, Gravlax (whatever that is), and Pork Gyoza. Fans of comedian Richard Herring report that their favourite TV show is Stewart Lee (insensitive, given the *bitter* rivalry). Newsnight profiled their viewers at the end of their show on Tuesday (self-absorbed and listen to New Order). It’s fun to play around with. But these statistics have been misinterpreted, because they have been mis-presented by YouGov. This show is a great institution: comedian Richard Herring interviews comedians and the occasional nerd in front of a live audience, there are tickets for the live recording, and then a free podcast online which has won Sony awards and stuff. Lots of previous episodes available online here, including Steve Coogan, Mary Beard, Stephen Fry, etc. Tickets online here, I’m up the same night as Sue Perkins who is awesome. Conway hall is a great institution, with lots of good events, worth a trip and worth joining. At this and the Foyles event below I think I’ll do a brand new lecture/show I’ve just written. Tickets online here, massive discount for students and members. Foyles has moved, I’ve not seen the new shop yet but genuinely looking forward to it as they’re an institution and bookshops are good. The talk is in their new events space at 7pm, tickets online here: smaller room, so I might do a more meandering talk, depending on what people seem to want on the night. Books and signing at each of them if that’s your thing (definitely for the last two). For an easy Christmas you could surprise everyone by doggedly giving them my canon with a stern smile: this is especially useful shopping advice for families with ideological rifts around quackery, vaccines, science etc. If you want to know what my talks are like there are some videos below, and more around the site. See you out! Taking epidemiology to the streets: here’s a long, long interview I did last week on Absolute FM (lovely Geoff Lloyd’s lovely Hometime Show). Posting here because it’s unusually good and long for pop media. In between the rock classics, we talk about screening, Ebola, government statistics, and good quality sperm. My lovely new book – I Think You’ll Find It’s A Bit More Complicated Than That – is out in two days. It’s a collection of short pieces, an epidemiology and research methods toilet book, if you will. More here and here. You should buy it for everyone you know, to make your squabbles more interesting.